McKenna Fromm, 23, said she didn’t want to share her story in her first year of sobriety, saying she felt ashamed. She had been crowned prom queen in high school, but addiction took her to a dark place. Now, she’s an open book about her past and wants to use it to help others. Feb. 15, 2019. Photo by Shaylee Ragar / UM Legislative News Service. Opioid addiction is raging across the U.S., and although the rate of addiction in Montana is down, Attorney General Tim Fox says even one overdose is one too many. Feb. 15, 2019. Photo by Shaylee Ragar / UM Legislative News Service. By 2015, she was living in a spider-infested “drug den,” estranged from her family and deep in addiction. Fromm’s story of opioid addiction is not unique. The National Institute on Drug Abuse reports that every day, more than 130 people die of overdosing on opioids in the U.S. Montana lawmakers are considering new legislation to combat this type of addiction -- the one that often begins with a legal prescription. Proposed laws include restricting prescriptions for first-time patients, creating a mandatory opioid registry and mandating doctors give counseling before prescribing opiate painkillers. Fromm’s diagnosis and subsequent pain shattered her dream of going to the University of Montana, and said she became deeply depressed after graduating from high school. She had to stay home in Great Falls and take classes online. That’s when she met someone who looked past her condition, and she dove into the relationship. Fromm said she’s surprised she’s still alive. “I am so grateful that they gave me that opportunity because I really needed to get out of the environment that I was in,” Fromm said. Fromm, now 23, will graduate from MSU this May with a degree in psychology and a sociology minor. She thrived in college, maintaining a 4.0 GPA, working at a Studio Barre gym and facilitating more than 100 addiction recovery groups. She is in the process of applying for a Master’s of Science program in health sciences. Fromm said she wants to get a master’s degree to use her personal experiences with pain, mental health struggles and addiction to help others who are in situations similar to her’s. “There is a light at the end of the tunnel. For the longest time, I never thought I would get there,” she said. 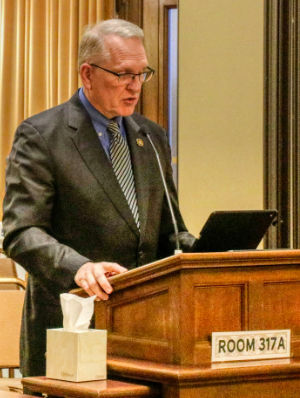 Montana’s Attorney General, Tim Fox, gave the lead supporting testimony for a bill heard in committee last week that would restrict opioid prescribing practices in an attempt to curb experiences like Fromm’s. The proposed legislation has three main components that would add restrictions to opioid prescriptions: requiring pharmacies to ask for a photo I.D. for prescription pick up in some cases, restricting an opioid-naive patient -- someone who hasn’t had an opiate medication in 90 days -- to only a 7-day supply and mandatory use of a prescription drug registry. There are exceptions in the bill for chronic pain patients. Montana’s rate of opioid abuse has actually decreased while rates around the country have risen, according to the National Institute on Drug Abuse. However, Fox said even one opioid-related death is unacceptable. “Any person who becomes addicted and requires treatment is one too many,” Fox said in an interview. Part of the opioid epidemic has been attributed to misleading marketing by pharmaceutical companies. In 2017, Fox’s office filed a lawsuit against Purdue Pharma, the largest marketer in Montana, claiming it decided to “promote opioids deceptively and illegally in order to significantly increase sale.” Litigation in the case is ongoing. Fox said he hopes that in addition to passing HB 86, the Legislature will add funding for specialty courts that have drug treatment programs, and for education and prevention programs. The attorney general’s Resolve Montana is one such program, and it’s website includes stories like Fromm’s and advice for using opioids responsibly for medical treatment. It also has bipartisan support. Democratic Rep. Zach Brown of Bozeman also testified in support of the bill at its hearing. He said he saw opioid pills floating around Bozeman High School when he was a student, and said that’s where addiction starts for some. Brown said he has a family member who couldn’t sleep without opioids after a knee replacement surgery, and that it was an eye opening experience for him. He introduced his own legislation to combat the opioid crisis. That bill, House Bill 419, would require medical practitioners and naturopathic physicians give patients counseling on the risks of opiate medications. He said it’s true that many doctors already do this, but that distorted marketing by pharmaceutical companies still has a grip on the medical community. “We’re working backwards from a place where doctors were told opioids were non-addictive,” Brown said in the bill’s hearing last week. Fromm said she thinks this legislation is a good idea. She said she didn’t know much about the pills that she was prescribed, but thought it was the only course of action she could take. “There can never be too much education,” Fromm said. The Montana Medical Association opposes Brown’s bill. Chief Executive Officer Jean Branscum said this type of counseling is already the standard of care in the medical community. She said physicians see the legislation as overregulation. Brown’s bill was tabled in committee, meaning it won’t move forward unless 58 members of the House vote to “blast” it to the full House for debate. "I'd like to be an advocate for those who traditional practices don't necessarily work for,” Fromm said. “And I would just love to be a positive force in their life and help catalyze growth and change in them."